Fantasy Flight Games is proud to announce Redemption and Return, the sixth Force Pack in the Endor cycle for Star Wars™: The Card Game! The battle for Endor has raged across three arenas—at the shield generator on the Forest Moon, in the skies around the Death Star, and in the Emperor’s throne room, where the Lords of the Sith confront the last Jedi. Throughout this cycle, you’ve followed the thrilling events of Return of the Jedi across these arenas. Now, with Redemption and Return, the Endor cycle accelerates to its climactic finale: the conflict between the Emperor, Darth Vader, and Luke Skywalker. 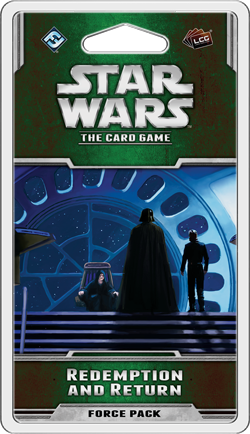 As the Emperor tempts Luke with the power of the dark side, and Luke Skywalker fights desperately to redeem his father, you can play out these iconic conflicts in your own games of Star Wars: The Card Game. 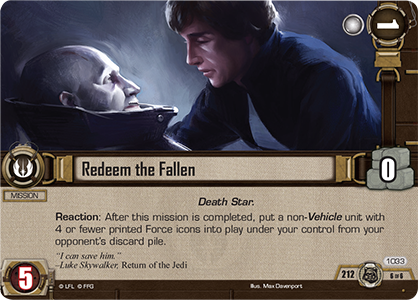 Like the other Force Packs of the Endor cycle, Redemption and Return also focuses on the new mission cards. Missions are objective cards that you can play under your opponent’s control, which offer powerful rewards when they’re destroyed. 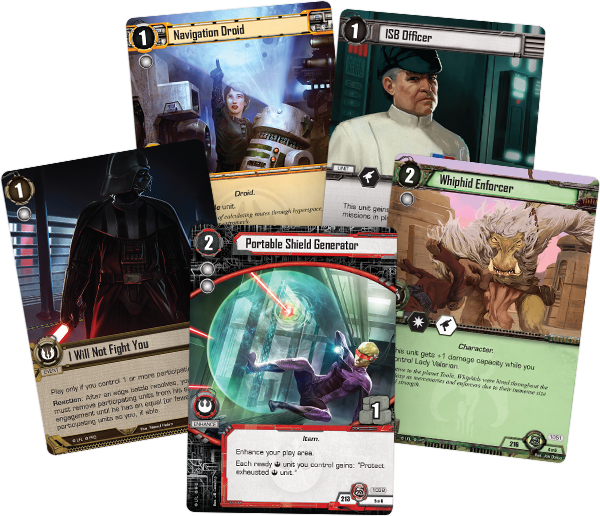 In addition to new missions, this expansion’s ten objective sets (two copies each of five distinct sets) offer new versions of iconic characters like Luke Skywalker and Emperor Palpatine to expand your options and inspire your deckbuilding. One of the new objective sets in Redemption and Return offers you the chance to take your place alongside Luke Skywalker on the Death Star, confronting the power of the dark side. Throughout this set, you’ll find ways to neutralize your opponent’s advantages and take control of the battlefield. 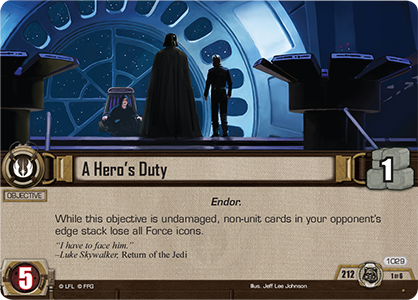 The set begins with A Hero's Duty (Redemption and Return, 1029), which reads, “While this objective is undamaged, non-unit cards in your opponent’s edge stack lose all Force icons.” Essentially, A Hero’s Duty forces your opponent to hold back some unit cards if he wants to win any edge battles, which has the added benefit of keeping those units out of play. 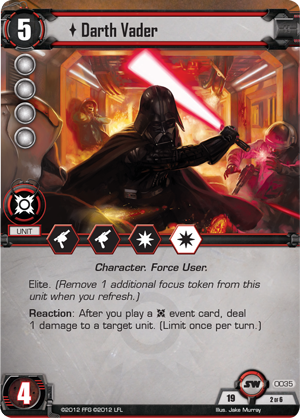 Darth Vader (Core Set, 35) is a powerful force in an edge battle, but most players would rather see the Dark Lord of the Sith in an edge stack than on the field of battle. This objective set also offers a new version of Luke Skywalker (Redemption and Return, 1030). Luke Skywalker bears the same cost, damage capacity, and combat icons as other versions, but his text is significantly different. 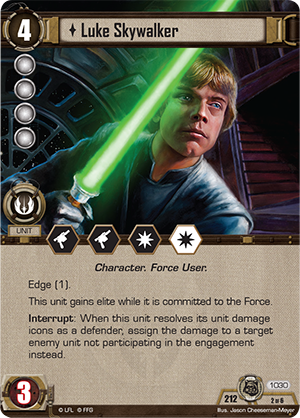 First, the newest version of Luke Skywalker has edge (1) and gains elite while committed to the Force. In addition, while Luke is defending, you can assign his unit damage to any enemy, instead of a unit participating in the engagement. 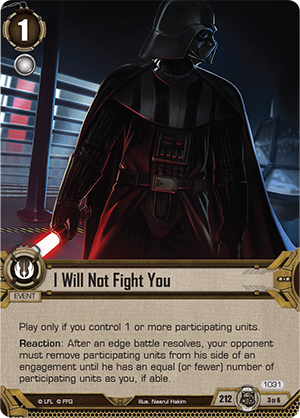 Your opponent may think twice about attacking when Luke Skywalker is ready to defend, unless he wants to risk losing the units he’s held in reserve. Whether you’re attacking or defending, your forces can often be overwhelmed by superior numbers. You may be unable to get unopposed damage to destroy an objective, or perhaps you don’t have enough tactics icons to neutralize every threat. For those situations, this objective set offers two powerful events. The first is I Will Not Fight You (Redemption and Return, 1031). You can play this event after the edge battle resolves to force your opponent to remove participating units from his side until he matches your numbers—thus negating his numerical advantage. 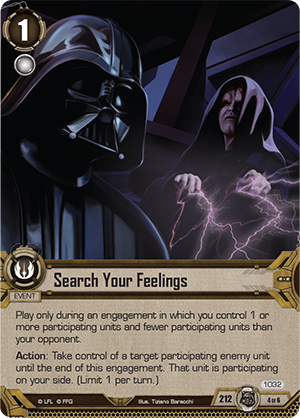 The second event included in the A Hero’s Duty objective set is Search Your Feelings (Redemption and Return, 1032). To play this event, you must have at least one participating unit and you must have fewer participating units that your opponent, but the effect is well worth the restrictions. When you play Search Your Feelings, you can take control of any participating enemy unit until the end of the engagement. What's more, that unit is now participating on your side of the battle! In this way, you can turn your opponent’s strongest weapons against him, destroying his units, locking down his forces with tactics, or even delivering the killing blow to an objective. This set also contains a copy of Secret Objective (Redemption and Return, 909)—one of the new fate cards introduced in the Endor cycle. If your opponent wasn’t worried enough about your attacks, Secret Objective lets you abruptly switch which objective you’re engaged with. Your opponent will need to treat every attack as if it’s an attack against his most vulnerable objective as long as you have this fate card in your deck. The objective set concludes with a new mission card, Redeem the Fallen (Redemption and Return, 1033). 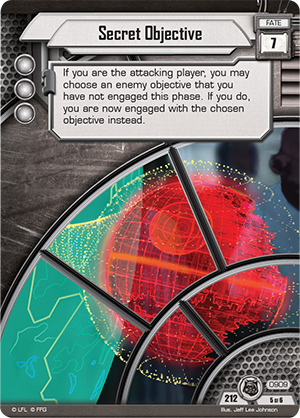 Like other mission cards, this card is played under your opponent’s control, and when destroyed, it counts as one of your destroyed objectives. However, it also offers a uniquely powerful effect: when you complete the Redeem the Fallen mission, you can put any non-Vehicle unit with four or fewer printed Force icons from your opponent’s discard pile into play under your control! If you’ve ever dreamed of seeing Luke Skywalker and Darth Vader battle together against the forces of evil, Redeem the Fallen is your chance to make that dream reality. The Endor cycle has followed the events of Return of the Jedi through to their epic conclusion. Now, you have a choice: will you replay the events of the film and redeem the fallen Anakin Skywalker, or will you tempt Luke to the dark side and establish a new reign of darkness? Make your choice and look for Redemption and Return at your local retailer in the second quarter of 2016!